This exquisitely crafted Woman of Worth devotion book will inspire women to walk along together and encourage each other to become women that God considers worthy. This elegant book has a padded front cover, foiled title, a silky ribbon marker and 176 gilt-edged pages making it a great gift. 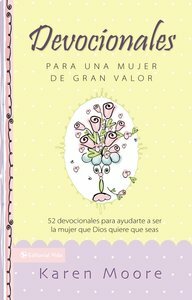 About "Devocionales Para Una Mujer De Gran Valor (Becoming A Woman Of Worth Devotional)"